Fashion is completely having a Cinderella moment, as in, everyone is wearing tulle! It’s been popping up all over for spring, and I was thrilled when I got my hands on the lovely gray tulle maxi skirt from Shabby Apple. I was immediately in love when I saw this skirt in the picture but when It arrived at my door and I put it on, oh my gosh, totally had my princess moment too! My style is quite feminine but even I haven’t worn anything that made me feel quite so beautiful. When I put this on to first pick out how I was going to style it, I ended up wearing it all over the house, and I tell you what, I totally felt like royalty. I didn’t want to take it off! I was sad when I had to! I know we often wear what we love and what LOOKS good, but how often do you wear something that truly makes you FEEL good?! Well this skirt totally did it for me! I didn’t want to take it off! It made me feel so happy! You might be wondering how in the world to style such a skirt. It’s easy! Because the skirt is so full and so feminine, toughen up your look a bit. Wear it with a T-shirt or tank to top to mellow down the drama, or like I did here, pair it with a fun crop top, a denim jacket, and some heavier shoes like this blue wedge I’m wearing. When you add some masculine or tougher, heavier accessories, it gives the look a good juxtaposition and keeps it from going over-the-top princess. 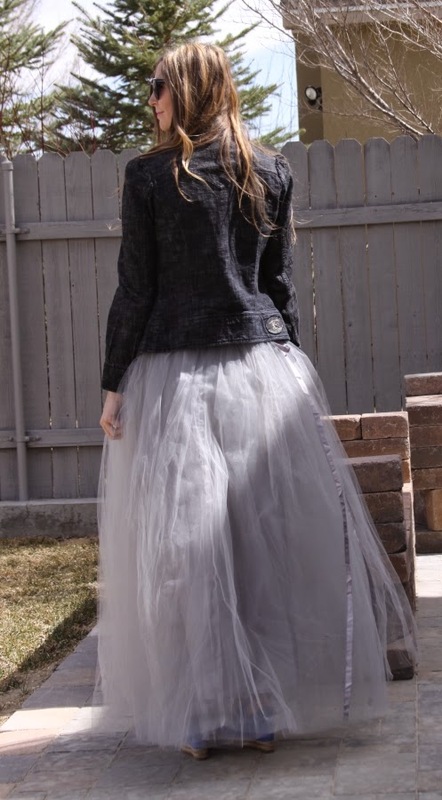 What do you think of this gorgeous tulle Skirt from Shabby Apple? Let me know in the comments I love hearing from you! Would you like to pick it up for yourself? You can shop it on ShabbyApple.com today! Follow them on Instagram and save 15% OFF your next order! * I was given this product for the purpose or review, however, all thoughts and opinions expressed in this post are solely my own. I only share reviews with my readers, I feel will be beneficial or informative in some way. Want to get more styling tips? Be sure to like MyStyleSpot on Facebook, and follow me on Instagram! This is okay on you but so not my style. That is amazing! I love fashion that is bold with a sense of fun. That tulle skirt is to die for! You look gorgeous indeed. Awesome look from head to toe! Love that it looks like a fairytale but not cheesy. This is no reflection on you personally in any way because I do love your style but I’m not fond of the tulle skirt on anyone. It’s just not a look I care for, just my honest feelings. But I still love your blog. Thanks. Love it! Different and fun! The skirt is just wonderful ! Love it! I dont think I’d ever be brave enough to wear this, but it looks so dreamy on you!! !